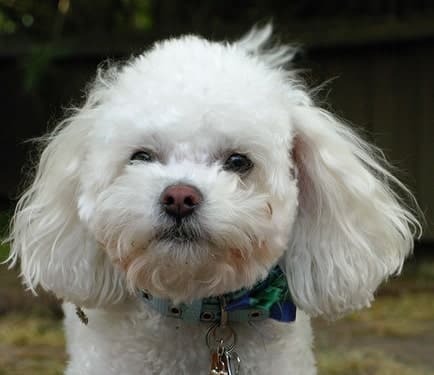 Poochon (Bichpoo)- The Bichon Frise Poodle Mix: Do You Want/Own One? 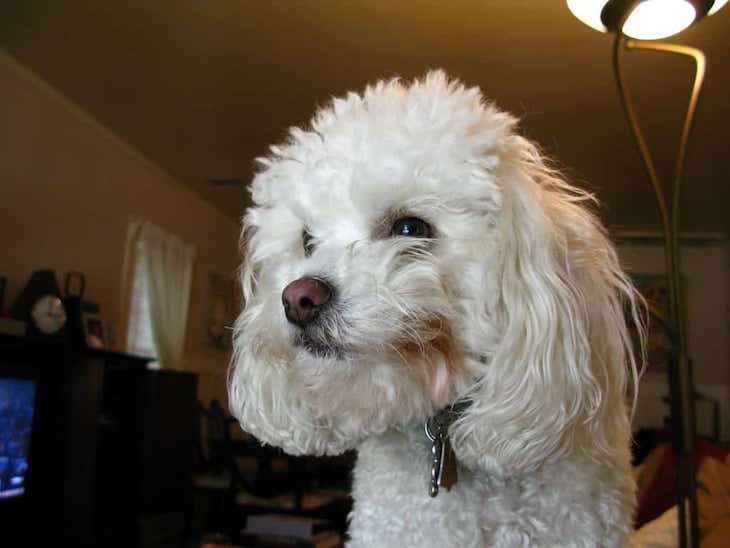 The Bichon Frise Poodle mix, also known as a Poochon or a Bichpoo, is a “designer” dog. It brings together the best characteristics of the Poodle with those of the Bichon Frise. If you want a Poochon, already own one or just want to know what to expect you are in the right place. Read On! The Poochon gained popularity in Australia during the late 90s. They were bred specifically for those wanting a small, active dog that doesn’t shed. The Bichpoo (Poochon) typical height is 1 foot and weights 8lbs to 16lbs (4-8 Kgs). Its lifespan is approximately 12 to 15 years. Like any hybrid dogs like Poodle Mixes, Bichpoo physical traits are not as predictable as a purebred, as it may inherit more or fewer traits from each of its parents’ breed. Poochons are generally characterized by almond-shaped eyes, slightly long ears, and round, short muzzle reminiscent of the Bichon Frise. The Poochon comes in cream, white, black, blue, and apricot. Their coat is medium-length, coarse and curly. Further, if one or both of the parents are not purebred themselves — for example, if they both are Bich-poos — the variability in the characteristics of the offspring increases significantly. 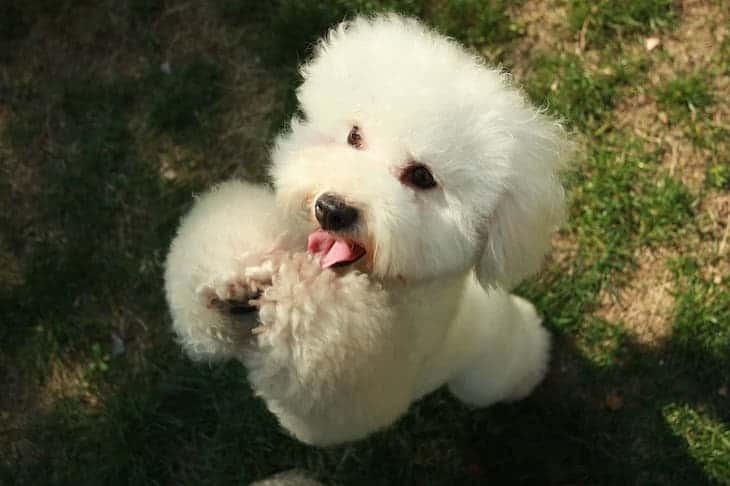 Both the Poodle and the Bichon Frise are active dogs, so it will be no surprise that your Bichpoo will have a lot of energy to burn. The Bichpoo does very well in a number of environments, but you need to cater for a daily exercise of at least half an hour, or a bit more if she does not have access to a backyard. Your Bich-poo will inherit a higher than average intelligence as both her parents, particularly the Poodle, are considered in the top quartile of intelligent dog breeds. It should be easy to house-train your Bichpoo fairly quickly and she will be quick to learn your nuances. Clearly, an active and intelligent pet will interact much more with you; this leads to the creation of a great bond between you and your Bich-poo. On the flip side, keep in mind that those very traits need to receive sustenance in the form of physical and mental stimulation. If you find your pet beginning to misbehave — whining, barking, chewing — you need to consider increasing the length of your walks and the time you and your family spend with her. A Bichon Frise Poodle Mix usually has an accommodating nature that will allow it to fit into most households. A family with young children will suit it perfectly; existing pets should not be a hindrance. Its good-natured and high-spirited personality will encourage a lot of play with your children. This is great because everybody benefits from such mental and physical stimulation. A word of caution, though: young children may get over exuberant and forget that a Bich-poo does not have the resilience of a cat; “toy-size” dogs like the Bichpoo are particularly prone to fractures when dropped from even the moderate height of a young child. Some Poodles are known to be somewhat high-strung and nervous. It is quite possible that your Bichpoo inherits more than a bit of that trait. So, you must focus on the socialization of your puppy to preclude the potential for “nippiness”. Separation anxiety can also become an issue with some individuals. The Bichpoo or Poochon, by definition, is a crossbreed, or hybrid. The cross of a purebred Bichon Frise and a purebred Poodle results in a first generation Bich-poo. First generation Bichpoos tend to be much healthier than either of their parents. 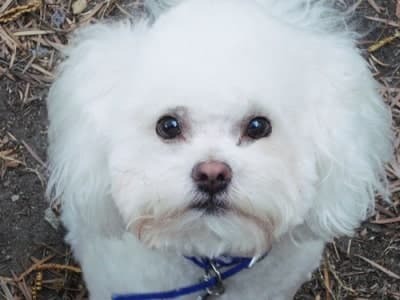 So, health problems of their parents — for example, Poodles are susceptible to Addison’s disease, Gastric Dilatation-Volvulus, and others while Bichon Frises are prone to Liver Shunts — could well bypass the first-generation of pups entirely. Unfortunately, the second generation tends not to be as healthy as first-generation hybrids. Additionally, the variability in the litter is likely to be higher especially if both parents are first-generation as oppose one being purebred. Third generation hybrids are crosses between two second-generation individuals. Many breeders do not offer them. Issues that affect second-generation hybrids tend to be accentuated in the third generation. Normally, no generation beyond the third generation is considered “hybrid”; they are just “mutts”. A plus to first generation hybrids is their lack of health problems. Many serious health problems that are common in parent breeds are not prevalent in their offspring. Furthermore, while not a health condition, Bichpoo’s are prone to fractures or breaks if dropped. Always supervise young children around your Bichpoo to avoid an emergency visit to the vet! Although they are a fairly low maintenance breed, Poochon grooming is still necessary. Their long, curly hair can get tangled easily. So, they require regular brushing to keep their coat smooth. Poochon haircuts are only necessary when their hair gets too long. They only need baths when needed but keep an eye out for ear infections. Also, brush your Bichpoo’s teeth a few times per week to help prevent tooth decay. When it comes to finding the perfect Poochon, take your lifestyle into account. Do you have time to dedicate to raising a puppy? Will you be able to stick to a consistent training schedule? If you can’t dedicate the time to raise a puppy, why not consider adopting an adult Bichpoo? Not only are Poochon adults calmer than Poochon puppies, they often know their basic commands and are housetrained. Adult Poochon’s are perfect for busy families or those looking for a calmer, quieter dog! Families will often get a Bichpoo without knowing the breed. Poochon puppies are cute and fluffy, but they grow into adults. (Even though a Poochon full grown is still adorable). Because of this, there are rescues dedicated to Poochons. Poochons for adoption are rare as most designer breeds are not commonly found in shelters. When deciding if Poochon rescue is for you, consider whether you would like to add an adult or puppy Poochon to your family. Additionally, some Bichpoo’s with special needs or health issues find themselves in shelters. Looking for a purebred Bichpoo puppy? Poochon breeders are the way to go. Before you commit to a specific breeder, do your research. Not every breeder is reputable. Because many breeders often have full-time jobs, their response time may not be immediate. Don’t get put off by that – a good breeder will be knowledgeable and make you feel comfortable. When you narrow down your Poochon breeder, arrange for a home or kennel visit. Ask to see at least one of the parents to get an idea of future temperament and appearance. Look around their house – is it clean? Do the puppies and dogs look well-fed and taken care of? Look for signs of sickness or malnutrition. Watch how the puppies and dogs interact with the breeder. Do the puppies and adults look like they are genuinely cared for? If there is any sign of a puppy or dog acting scared or shy that is a red flag. Always ask for the health of the puppies and parents. Breeders should be well aware of the genetic health conditions. A very responsible breeder will ask you to sign a contract stating that if specific conditions aren’t met, the breeder can reclaim the puppy. Finally, make sure you feel comfortable asking the breeder questions. They should also ask you questions to make sure the Bichpoo is the right fit for your family. The Bichon Frise Poodle mix (Poochon or Bichpoo) usually results in a delightful bundle of joy. The Poochon’s personality and size make them perfect for apartment dwellers. If they get their daily walks, Poochons do spectacularly in smaller spaces. Expect to pay anywhere from $350 to $1000 for a pup. Read 6 Tips To Guarantee The Best Bichon Frise Price for great tips on getting a good deal. Aim to get a first-generation Bichpoo since they tend to be the most robust. This may not be as easy as it seems because there is no obvious way of determining that a particular pup is first-generation. Your best bet could be a well-reputed breeder or a situation in which you have a high degree of certainty with regards to the pup’s parents.